When you need any type of auto service, a lot of people make the mistake of going with a random chain shop like Mr. Lube, especially if they’re just getting basic maintenance. But if you’re looking for the best service at the best price, going through a chain is a mistake. What does Authorized Lexus Service mean? It means that your work is being performed by Lexus trained technicians who use the best tools, techniques, and parts. It also means savings, and if you can get better service for less, why wouldn’t you? Finally, it means that every vehicle we work on receives a complimentary carwash and vacuuming, because when you drive away, your car should run and look its best. Ready to discover the unrivaled value and satisfaction offered by Authorized Lexus Service? Then visit Lexus of London today, where you’ll find savings and service unlike anything provided by the generic chain shops. Your Lexus doesn’t deserve generic service. It deserves the best. 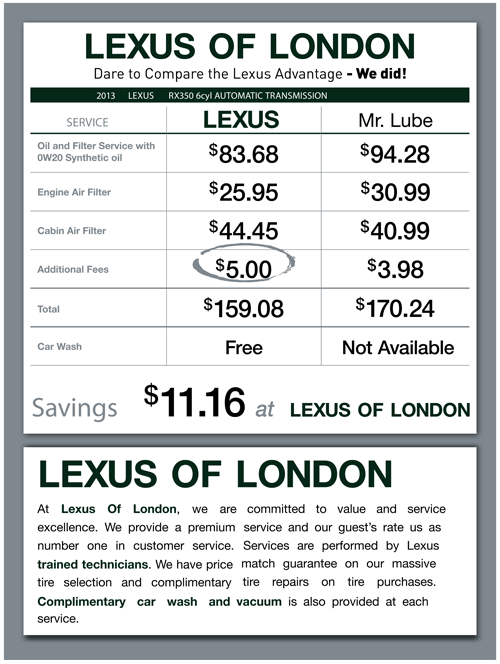 Read more about Authorized Lexus Service online, or call Lexus of London at (888) 691-8453.